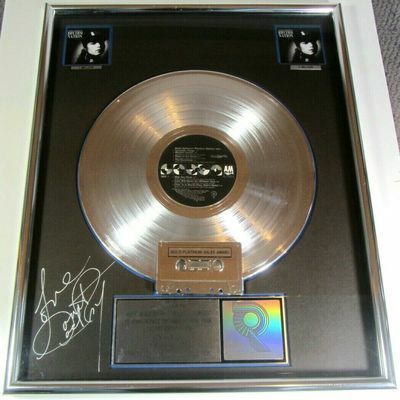 COMMENTS: This is an authentic 17x21 RIAA CERTIFIED 2X PLATINUM SALES AWARD to commemorate the sale of 2,000,000 copies that was presented to MARK BENZENBERG - BELIEVE IN MUSIC (our stores). The RIAA certification release date was 11/21/1989. It has a metal over wood frame with a sawtooth hanger. It is double matted with black over blue. It has a black cardboard backing with a label for Fitzgerald Hartley Marketing who manufactured the award. The award is fully intact with no damage of note. The autograph on the mat board was made with a silver metallic pen and is not a facsimile. Comparisons to the same award show differences in all of the autographs. I AM IN THE PROCESS OF LIQUIDATING MY COLLECTION OF THOUSANDS OF LP'S, CD'S AUTOGRAPHS AND OTHER MUSIC MEMORABILIA THAT WAS ACCUMULATED OVER DECADES OF BEING IN THE RETAIL MUSIC BUSINESS. NEARLY ALL OF THE LP'S AND CD'S WERE IMMEDIATELY PUT IN STORAGE AND HAVE NEVER BEEN PLAYED. ALL ARE GUARANTEED TO BE ORIGINAL PRESSINGS. SHIPPING AND PACKAGING: FAST SHIPMENTS GUARANTEED. Shipments are processed in 3 business days or less to allow time for packaging. Only the highest quality box and packing materials are used for PROPER PACKAGING to assure your item arrives safely.